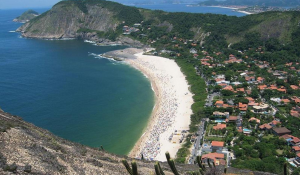 RIO DE JANEIRO, BRAZIL – Niterói, the city located across the Guanabara Bay from Rio de Janeiro, will follow its sister city’s lead, by implementing the policing program Operação Verão (Operation Summer) on nine of its beaches during weekends and holidays of the summer season. Niterói’s Itacoatiara Beach will be one of the city’s nine beaches included in Operação Verão 2015, photo by Wikimapa/Creative Commons License. According to authorities, the security operation will include over two hundred municipal guards monitoring the shorelines and surrounding areas of the nine Niterói beaches of Adão e Eva, Camboinhas, Charitas, Icaraí, Itacoatiara, Itaipu, Piratininga, São Francisco and Sossego. While there have been no recent reports of “arrastões” (big drags) on Niterói beaches, the operation is being implemented on the city’s beaches following the mass robberies in Rio de Janeiro’s Zona Sul (South Zone) on September 19th and 20th. In Niterói, Operação Verão 2015 is seen as a preventative measure. The additional officers will monitor overcharging by parking attendants near the city’s beaches as well as illegal selling by vendors and other forms of misconduct that might threaten the public or disturb their enjoyment of the beaches. Other measures to combat crime in the city include the recently opened Centro Integrado de Segurança Pública (Integrated Center of Public Security, or CISP). Inaugurated in August, the plans for the center include the integration of federal, state and local security forces and surveillance systems featuring six hundred cameras to monitor the city twenty-four hours a day. Reportedly, at least two hundred of the cameras are already in place and monitoring the city. The remaining cameras are scheduled to be in place by the end of the year. Operação Verão 2015 will take place on the nine Niterói beaches every weekend and on holidays through the 28th of February 2016. The operation will also be implemented on Mondays, Thursdays and Fridays during school holidays and vaccation periods.